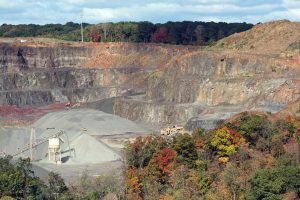 An Oklahoma quarry producing crushed stone implemented a major expansion that added four new process areas: primary screening, secondary crushing, tertiary plant, and chip plant. The primary screening fed the secondary crushing plant via a surge pile and the tertiary plant fed the chip plant via a surge pile. The secondary plant included a 7’ cone crusher and a 5’ cone crusher, each with 2400V 500HP motors. The chip plant included (2) VSI crushers driven by 300HP PowerFlex 700 VFDs. The power system included a new 24kV overhead distribution that fed individual transformers, switchgear and MCCs for each process area in addition to the existing plant. The secondary plant had a 25kV-2.4kV transformer and 2400VAC MCC in addition to the 25kV-480V transformer and MCC. The new 2400V and 480V transformers were all delta/wye with high resistance ground. Each process area was equipped with new container E-houses for Allen Bradley Intellicenter MCCs and RIO. Each of the four E-houses were tied together and back to the central control room at the secondary plant via fiber optics or wireless. The control system was an Allen Bradley ControlLogix with FactoryTalk View SE distributed HMI (redundant servers), three clients, and an engineering workstation. This design-build project was completed over a 12-month period. We were responsible for all engineering, design, integration, and installation for the power system, control system, instrumentation, network, E-houses, control room, and camera system. The customer provided all design and installation for the process equipment, foundations, and civil work. Deliverables included power equipment specifications; short circuit analysis; coordination study; arc flash study; building layout plans; single lines; grounding plans; lighting plans; instrument, motor, device, and raceway plans; panel and BOM drawings; PLC schematics; motor elementary drawings; network drawings; PLC and HMI configuration; instrument calibration; E&I Installation services; checkout; and commissioning. The final result was a turnkey electrical, instrumentation, and control system solution.